The meter collects voltage signals from the potentiometer. The current signals collected from the shunt to get multiplying signals through multiplication device, and after frequency converting, get counting pulses, which is in direct ratio with the product of voltage and current. The counting pulses of electric energy will be sent to CPU for processing through electro-coupling, and be stored in nonvolatile E2PROM after operation. These pulses and information from IC card that been stored with some volume of electricity and data of supervisory demands will be processed by micro processing system in the meter then provide signals of display, warning and cutting-off state etc. It adopts large-scale integration (LSI) and surface mounting technology (SMT), the main components use international famous brand, so the meter has high reliability and long service life. 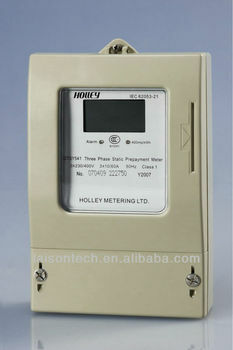 The meter case uses fire-resistant ABS material, and the structure of the meter is air-proofed. Single-chip processing system in the module responsible for the data operation. Starting current Class 1≤ 0.004Ib; Class 2≤ 0.005Ib.